Mill Creek is ADA compliant. We have handicapped parking readily accessible to a lower entrance with elevator and a main entrance with ramp. Our doorways are wide enough for wheelchairs and our bathrooms are equipped with support bars. We do not have roll-in showers. If you require this, please call our front desk and we will identify suitable accommodations at a nearby hotel. The Mill Creek Hotel is committed to facilitating an accessible website, www.millcreekhotel.com, in an effort to create a usable experience for all persons with disabilities, and has adopted this website accessibility policy to support its commitment to the accessibility of www.millcreekhotel.com. We have implemented the accessibility standards set forth in the World Wide Web Consortium’s Web Content Accessibility Guidelines 2.0 Level AA (WCAG 2.0 AA) to show its commitment to being web accessibility stewards and upholding the highest user-friendly standards. 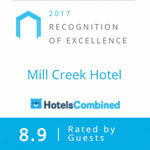 Using the WCAG 2.0 AA standard also brings www.millcreekhotel.com into further conformance with the Section 508 Web Accessibility Standards developed by the United States Access Board. To ensure our website corresponds with the WCAG 2.0 AA accessibility benchmarks, we will (1) have recurring website accessibility audits regarding conformance with WCAG 2.0 AA standards, and (2) test www.millcreekhotel.com on a periodic basis with assistive technology, such as screen readers and screen magnifiers. 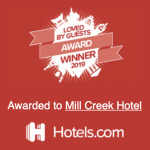 Please be aware that our efforts are ongoing and that certain portions of www.millcreekhotel.com may link to third party sites over which The Mill Creek Hotel does not have control. While we work with these third parties to promote accessibility of their sites, we cannot guarantee that they meet the same standards as our own website. 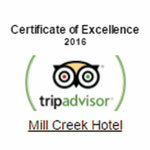 If, at any time, you have specific questions or concerns about the accessibility of any particular web page on www.millcreekhotel.com, please contact us at office@millcreekhotel.com or call 877-624-5494. If you do encounter an accessibility issue, please be sure to specify the web page in your email, and we will make all reasonable efforts to make that page accessible for you.